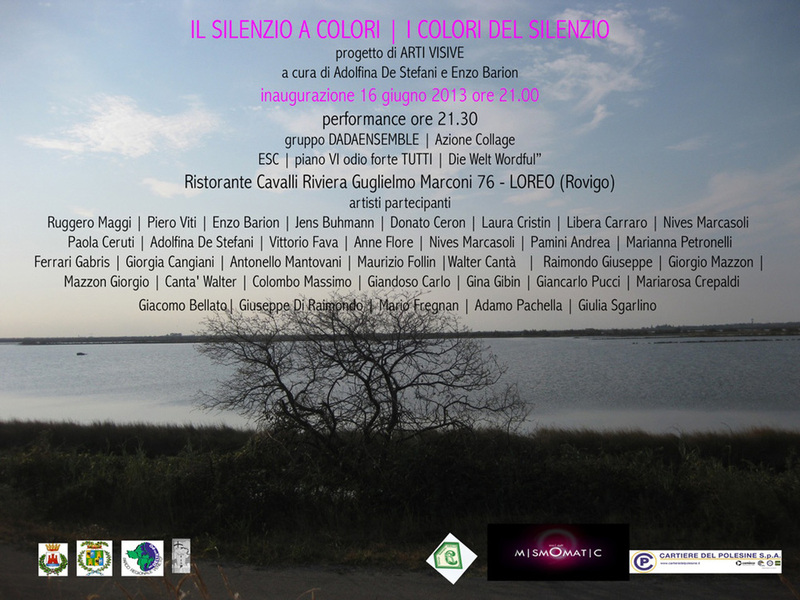 “Silence with Colors | Colors of the silence” progetto di ARTI VISIVE Collettiva presso sala espositiva ristorante Cavalli, 16 Giugno-17 Luglio. Opening: 16 june 2013 at 21.00. Taking into account the place intended as a geographical area where many writers and artists of various trends have dedicated and described, the invited artists from various backgrounds have worked on the concept of hybridization between art, respect for the environment and the reflection that comes with it. The group proposes a reflection on the culture that the town offers to the visitor, on the language of colors that alternating between winter and summer, and the thought that the poetic landscape views forward. An exhibition that can do reconnaissance to a culture of continuous change. The exhibition allows a reflection on the different historical and artistic avant-garde and allows you to approach the “Polesana” culture and the attention of the contemporary thought. The man and the river accompany it, side by side in a silent way. A constant give-and-take of large promises, thoughts, dropouts and research. Each shiny mirror in surface, a tangle of deep emotions inside.